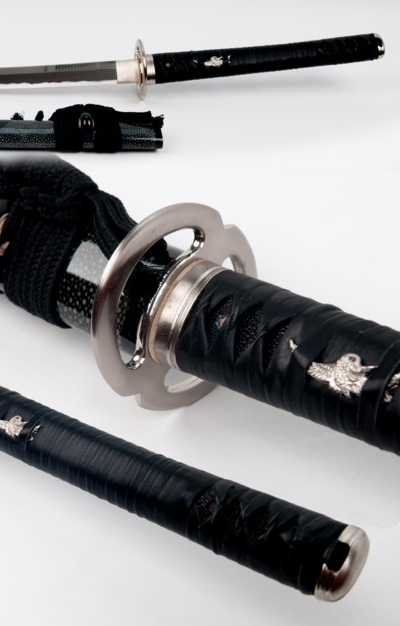 Shintogo Handmade Musashi Katana. The Ito is Black Leather wrapped in Katate-maki (Battle Wrap) style over Black Rayskin. Tsuka is double pinned with bamboo mekugi, leather Ito wrapped with hishigami. Saya is wood with Black finish and Black rayskin. 3 pc bullhorn, Black silk Sageo. Comes with wooden case , Black cotton sword bag, stand, cleaning kit. Beautiful sword.